Fairy slot games aren't that rare in the gaming world, but this high quality slot from Just For the Win has some pretty great game design and some excellent, extra features, making it more of an unusual creature. Fortunately, you won't have to go traipsing through the woodlands in the wee hours to find it and profit from the luck of the fairies. From the comfort of your own home, you can be transported to the mystical land of make believe. Place your deposit and start spinning to go on this otherworldly adventure today. This beautifully designed game has 5 reels, 3 rows and 20 paylines. A background of green leaves sits behind the pale, green reels edged by a Celtic inspired gold frame that resembles a detailed piece of goldwork. The design is sophisticated and uncluttered, evoking class and elegance through every element. Lower value symbols are different coloured gemstones with green vines wrapped around their edges. The higher value symbols are the fairies of this mystical woodland. Each of the 4 creatures has a distinct colour and an impish expression, but one that’s cheeky rather than threatening. There are 3 different wilds - a regular one that swaps in for other symbols, a free spin wild, and a respin wild. Landing the respin wild on reel 3 triggers an additional feature, where all of the wilds that landed stick for the next spin, so it's possible to gain further free spins. The scatter is the Goldwyn's Fairies logo in gold, on a purple background. Landing this symbol at least 3 times on the 1st, 3rd and 5th reel gives you 9 free spins. In addition to the free spin wild, there's good scope for free games with these features. The illustrations in this classy game are one of its strongest features, but the extra features and potential for free spins makes it even more high quality. The game is satisfying to play, with just enough going on to keep players from getting bored. On the other hand, it's not cluttered or overly complicated. 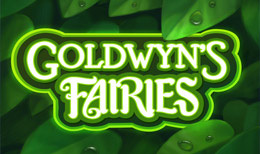 Amongst all the mythological themed games currently on the market, Goldwyn's Fairies is a particularly smart offer that will totally take you away with the fairies. This is a great game from one of the newer game developers in the slot game industry.